Front of Para Site during the exhibition, Passage/Interaction: Virginia Chu & Ling Lee in 1998. Exhibition curated by Leung Chi Wo and Marc Brulhart. Para Site, Hong Kong’s leading contemporary art center and one of the oldest and most active independent art institutions in Asia, will move from its current location in Sheung Wan to a significantly larger new venue in North Point/Quarry Bay. 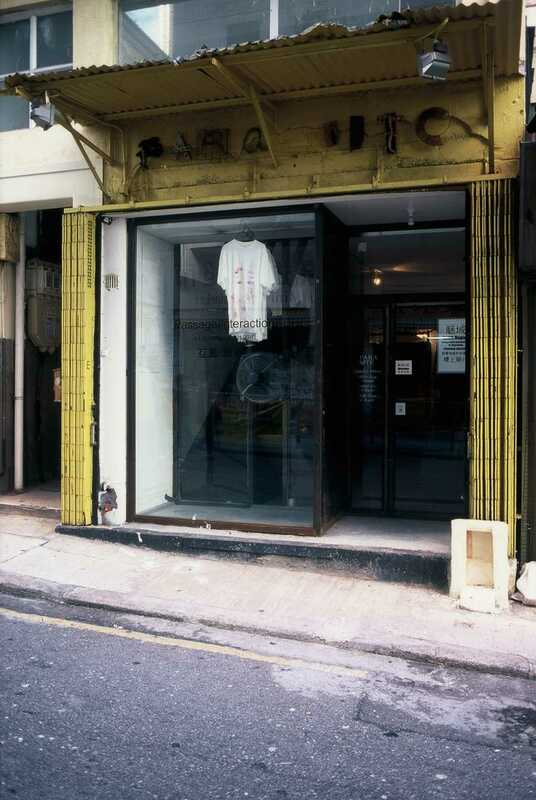 Para Site first opened its doors in Sheung Wan in 1997 (after being founded in early 1996 in Kennedy Town) when the neighborhood was mainly a local and traditional residential area, punctuated with small, family-run businesses. Over the last few years, the neighborhood has undergone a significant transformation and is now home to trendy cafes and boutiques. Para Site’s move reflects not only the institution’s growth into a mid-size art center of international relevance, but also a desire to remain close to the organization’s roots, and its engagement with Hong Kong’s complex society. The new venue in North Point will be set in one of the densest places on Earth and one of the most socially diverse neighborhoods of Hong Kong. North Point holds a special place in our city’s history, having been at the core of social transformations and leftist movements over the past half a century. It has also been a popular gathering place for those new and old to Hong Kong. In the 1920’s the Ming Yuen amusement park was a major destination for locals as was the North Point beach. In the 1930’s, it became home to the North Point Refugee Camp, built to accommodate the waves of refugees from Mainland China. During World War II and the Japanese Occupation, this same camp was used to house prisoners of war. After 1947, North Point saw a massive influx of Shanghainese refugees, rich and poor, giving the neighborhood the name “Little Shanghai” and becoming known for its leftist politics and institutions (such as the iconic Sunbeam Theater for Chinese Opera). Another important wave of refugees to the neighborhood were diasporic Fujianese Chinese fleeing political turbulences across South East Asia, who gave North Point its second name “Little Fujian.” The neighborhood also hosts Model Housing Estate, the oldest existing public housing estate in Hong Kong. North Point is currently the home of several non-profit art spaces and institutions such as Oi! and Connecting Space Hong Kong. The new North Point venue, located at 22F, Wing Wah Industrial building, 677 King’s Road, Hong Kong, (MTR station: Quarry Bay) will provide a much larger space for future exhibitions and events as well as boasting panoramic views over Victoria Harbor and the entire neighborhood. The public will have an opportunity for a sneak peek at the new space with the preview of Para Site’s fundraising auction in early December. The first exhibition at the North Point venue will open on 6 March 2015. Until then, please join us for our exhibition Islands off the Shores of Asia, on view at Spring Workshop between 27 September and 7 December. Para Site will host a farewell party and a lunchtime roundtable at 4 Po Yan Street on 19 September. The roundtable discussion will reflect on the evolving urgencies of independent art practices in the Hong Kong art ecology, looking more closely at what it means to be “independent” or “autonomous” under the current circumstances in the city. Moderated by Para Site co-founder and artist Leung Chi Wo, this discussion will feature a cross section of perspectives from both long-time and young local art practitioners such as John Batten, Tobias Berger, Wallace Chang, Gum Cheng, Cosmin Costinas, Valerie Doran, Kong Chun Hei, Claire Hsu, Isaac Leung and Ivy Lin. Light lunch refreshments will be provided. The Farewell Po Yan Street party invites everyone for a last party in Para Site’s current premise, in a night filled with music, drinks and snacks. Featuring music by sound artist, musician and DJ Alok Leung, the Farewell Po Yan Street party is a celebration of Para Site’s 18 years in Sheung Wan with our friends and collaborators.